I can't believe that we're in February already. I had a lovely start to the year having a "staycation" in the Gold Coast looking after Master and Miss Magoo while they were on school holidays. We spent a lot of time in the water, at the beach and just chillin' out. 2017 was a busy year so it has been so special to have such a slow and enjoyable start to the year with some of my favourite people. I hope your start to the year has been equally relaxing and fun. One of the downsides to of all the sun, water and air conditioning is the drying effect on my skin. Do you find that as well? I drink a load of filtered water to hydrate from the inside out, as well as up the ante on my skincare regime. And talking about skincare, I am LOVING Miss Magoo's new Coconut & Lemon Myrtle Body Scrub! It has such a gorgeous refreshing smell that lingers on the skin and is wonderful for all over body smoothing and moisturising. I use it daily in the shower. Not only do body scrubs exfoliate your skin, they also stimulate blood circulation (which helps to nourish your skin cells) and help the body to remove toxins. Win, win! Miss Magoo's Coconut & Lemon Myrtle Body Scrub uses a simple yet effective concoction of natural and organic ingredients designed to buff, smooth and moisturise your body. Epsom Salt provides the abrasive texture that exfoliates your skin and removes the dead skin cells. We use Epsom Salt because the magnesium can help reduce inflammation, and the sulfates flush out toxins. It also promotes circulation and skin regeneration. Organic Lemon Myrtle Oil. The Lemon Myrtle plant is an Australia Native and has many uses both topically and when consumed. It has a wonderfully fresh and uplifting scent. Lemon Myrtle Oil is useful for treating oily skin and acne and contains antioxidants that protect the skin against free radicals that age the skin. If you're having trouble sleeping, Lemon Myrtle can help to relax the body and calm the mind promoting a good night sleep. Organic Coconut Oil - not only does this oil smell like a tropical holiday in a jar, it has many beneficial properties for your skin. Coconut Oil contains antioxidants that protect the skin against free radicals that age the skin and is also very nourishing and moisturising. This delicious scrub will leave your skin feeling oh so soft and smooth. Buy now. 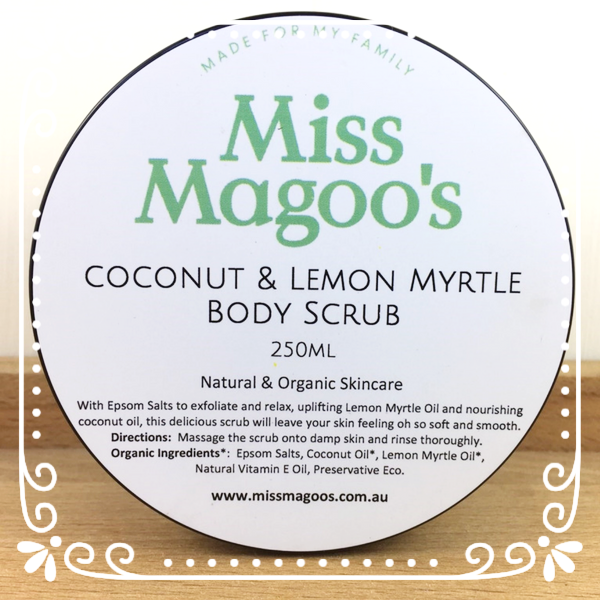 Miss Magoo's Coconut & Lemon Myrtle Body Scrub replaces our Coconut and Vanilla Body Scrub as the cost of good quality vanilla beans keeps on increasing, making it harder to create a quality product at a reasonable price. I hope you love the replacement Body Scrub as much as I do.